Dr Malcolm Garner and David Pointon have, for several years, spent a lot of time in the Gambia: Malcolm’s objective is to help children who have impaired hearing and David’s is to work with the Gambian Organisation of the Visually Impaired (Govi). Govi is the only organisation in that country working for the promotion of equal rights and full participation for visually impaired people. 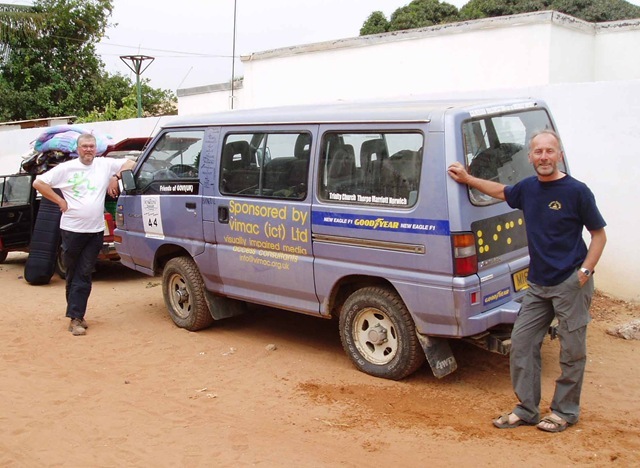 In January 2004 Malcolm and David drove a four-wheeled drive diesel Mitsubishi minibus overland to the Gambia and for over two years it served as the school bus at the Govi Resource Centre near Banjul. That Resource Centre provides the only school for the blind in the Gambia. (Above) David and Malcolm (right) on arrival in the Gambia in 2004. 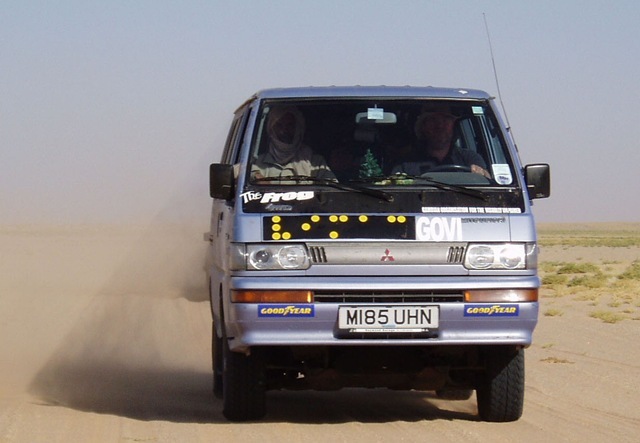 The Mitsubishi “Mitsi” being driven through the desert to the Gambia. A romantic view of what was a very tough drive. 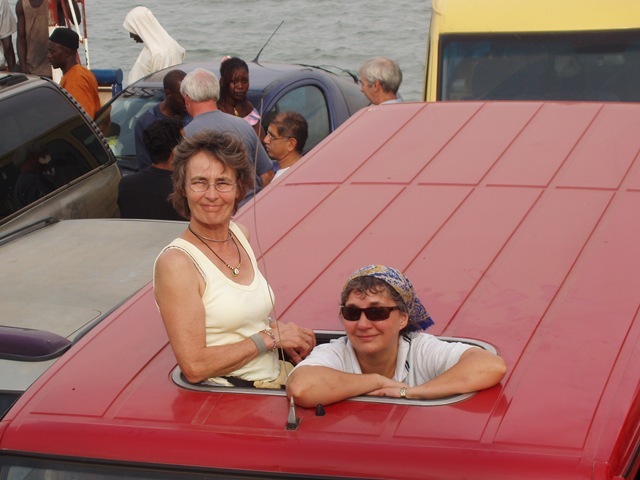 When the Dales Team took two new school buses to the Gambia in November 2006 the new road through Mauritania was open and so there was no desert driving like this. It was in April 2006 that David introduced me to the idea of helping blind children in the Gambia. By then he had visited that country several times to help at the school for the blind as well as to deliver Mitsi. By 2006 Mitsi needed replacing and David had begun to dream of taking something bigger and better. I wrote a feature for the Darlington and Stockton Times about his dream and within a few months the Dales Team had formed. The team consisted of David, myself, Ken Nicholas, Donna Parker and Hazel Townesend from Wensleydale; Ray Wright from Arkengarthdale; Charles and Elaine Wood from nearby Richmond; and Frank Whitfield from East Cowton near Darlington. 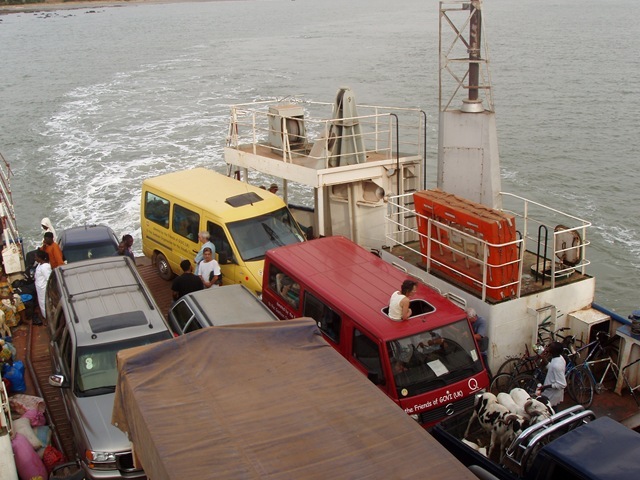 By September three of the team (David, Charles and Ray) were able to travel to Germany to buy two Mercedes minibuses – a Sprinter and an MB100 as, for the Gambia, we needed left-hand drive vehicles. David likes Mercedes anyway, and the parts and expertise for them are easily available in that part of Africa. 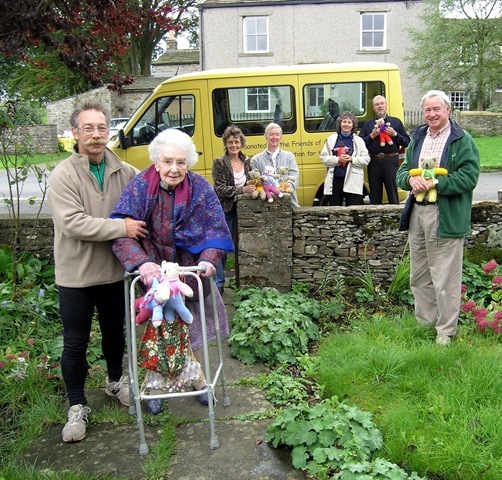 (Above) When 100-years-old Kathleen Davies (who now lives in Bainbridge) heard about our adventure she decided to knit teddies for the children. Here she is with Ken. By the Sprinter are, from the left, Donna, Hazel, Pip, David and Ray. As a team we raised over £13,000 for this project which included what we put in the kitty to cover our travel expenses. We left England on November 23 and reached Banjul on December 11 after a fascinating journey which had taken us through Morocco, Mauritania and Senegal. 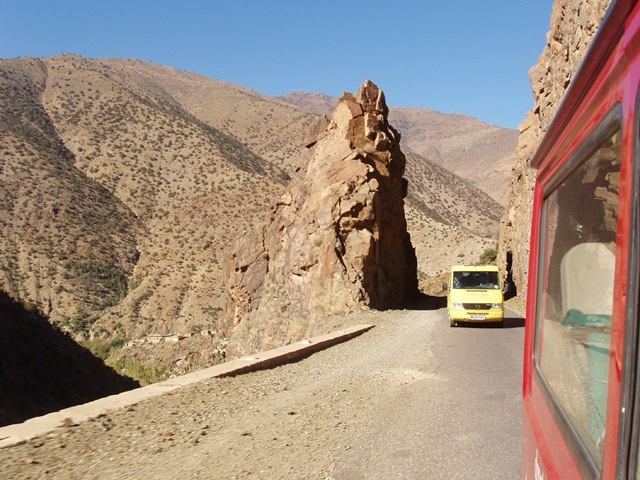 In Morocco all of us especially enjoyed our short visit to Marrakech and the drive through the Atlas Mountains. The most memorable moment for all of us was arriving at the school and receiving such a warm, wonderful welcome from the staff and students. We not only delivered the new school buses but also equipment like computers, a printer and a computer driven embosser. David made sure that these were soon “up and running”. (Right) School children exploring their new school bus. But for these two vehicles so many would not be able to go to school. Even so there are many others, scattered throughout the Gambia, who cannot access this facility. 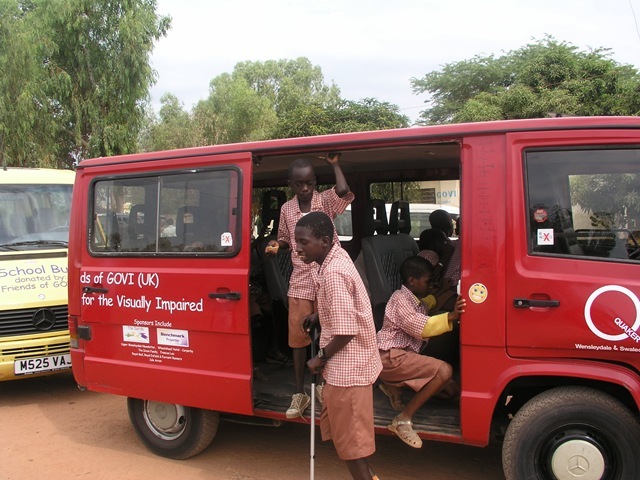 It is estimated that there are over 300 visually impaired children on the north bank of the River Gambia beyond the reach of the school buses. That is why David latest dream is to work with the Gambian teachers’ training college to train all teachers so that they can help the visually and hearing impaired children in main stream schools. Mitsi has been repaired and both David and Malcolm use it when working in the Gambia. David hopes that in 2009 it will be possible to find a suitable left-hand drive vehicle which can be equipped to provide a support facility for teachers in main stream schools. And so the fund raising continues through the Friends of Govi (UK). David has been a trustee of this UK charity since the late 1990s. See Friends of Govi for more information.